News | Will the Real Monster Black Hole Please Stand Up? 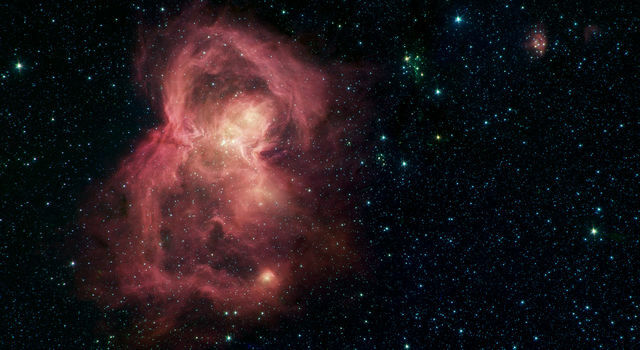 A new high-energy X-ray image from NASA's Nuclear Spectroscopic Telescope Array, or NuSTAR, has pinpointed the true monster of a galactic mashup. The image shows two colliding galaxies, collectively called Arp 299, located 134 million light-years away. Each of the galaxies has a supermassive black hole at its heart. NuSTAR has revealed that the black hole located at the right of the pair is actively gorging on gas, while its partner is either dormant or hidden under gas and dust. The findings are helping researchers understand how the merging of galaxies can trigger black holes to start feeding, an important step in the evolution of galaxies. "When galaxies collide, gas is sloshed around and driven into their respective nuclei, fueling the growth of black holes and the formation of stars," said Andrew Ptak of NASA's Goddard Space Flight Center in Greenbelt, Maryland, lead author of a new study accepted for publication in the Astrophysical Journal. "We want to understand the mechanisms that trigger the black holes to turn on and start consuming the gas." NuSTAR is the first telescope capable of pinpointing where high-energy X-rays are coming from in the tangled galaxies of Arp 299. Previous observations from other telescopes, including NASA's Chandra X-ray Observatory and the European Space Agency's XMM-Newton, which detect lower-energy X-rays, had indicated the presence of active supermassive black holes in Arp 299. However, it was not clear from those data alone if one or both of the black holes was feeding, or "accreting," a process in which a black hole bulks up in mass as its gravity drags gas onto it. The new X-ray data from NuSTAR -- overlaid on a visible-light image from NASA's Hubble Space Telescope -- show that the black hole on the right is, in fact, the hungry one. 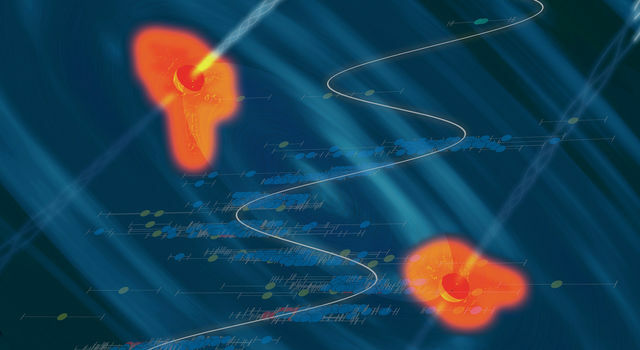 As it feeds on gas, energetic processes close to the black hole heat electrons and protons to about hundreds of millions of degrees, creating a superhot plasma, or corona, that boosts the visible light up to high-energy X-rays. 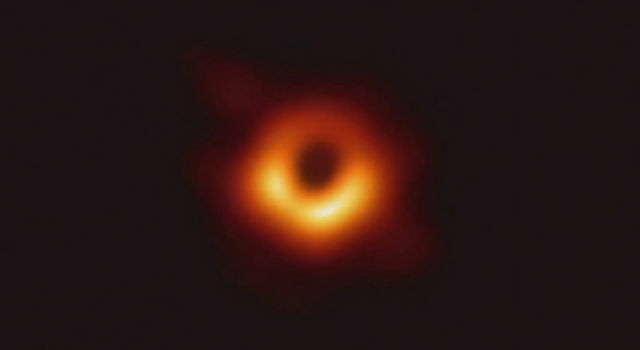 Meanwhile, the black hole on the left either is "snoozing away," in what is referred to as a quiescent, or dormant state, or is buried in so much gas and dust that the high-energy X-rays can't escape. "Odds are low that both black holes are on at the same time in a merging pair of galaxies," said Ann Hornschemeier, a co-author of the study who presented the results Thursday at the annual American Astronomical Society meeting in Seattle. "When the cores of the galaxies get closer, however, tidal forces slosh the gas and stars around vigorously, and, at that point, both black holes may turn on." NuSTAR is ideally suited to study heavily obscured black holes such as those in Arp 299. High-energy X-rays can penetrate the thick gas, whereas lower-energy X-rays and light get blocked. Ptak said, "Before now, we couldn't pinpoint the real monster in the merger." 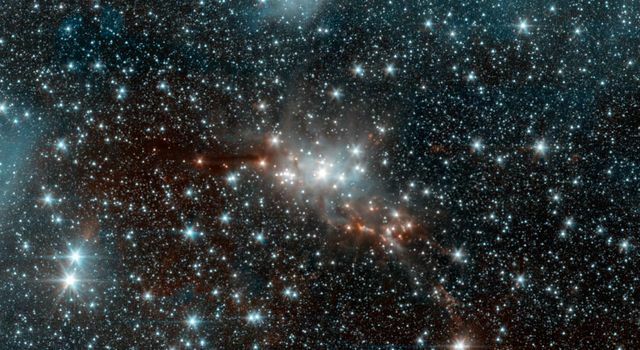 NASA is exploring our solar system and beyond to understand the universe and our place in it. The agency seeks to unravel the secrets of our universe, its origins and evolution, and search for life among the stars. 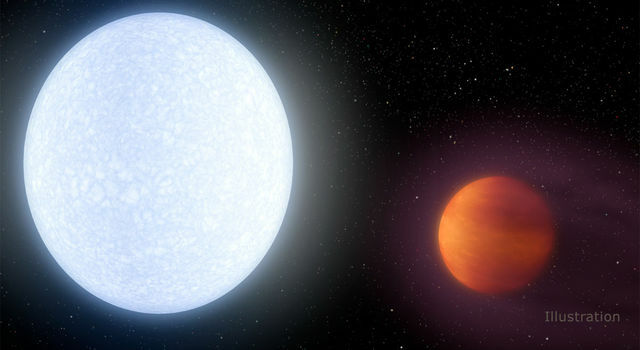 For more information, visit http://www.nasa.gov/nustar and http://www.nustar.caltech.edu/ .